A five member delegation of AIP lead by Er. Rasheed met Home Minister Rajnath Singh in Sinagar on Sunday and reiterated that the best way to resolve Kashmir dispute is to hold plebiscite on both sides of LOC, spokesman said. Spokesman said that Rasheed told visiting Home Minister that I”in principle we are not against probing anything but why should only pro-resistance leaders be targeted. If probing financial resources and creating assets is the only issue that needed to be probed, Govt. must probe the huge assets created by politicians and bureaucrats who pretend to be loyal to the Indian state”. Rasheed had cautioned Home Minister of the disastrous consequences of efforts to create a political vacuum by bulldozing and targeting Huriyat and said that New Delhi has to respect the political leadership at all costs. 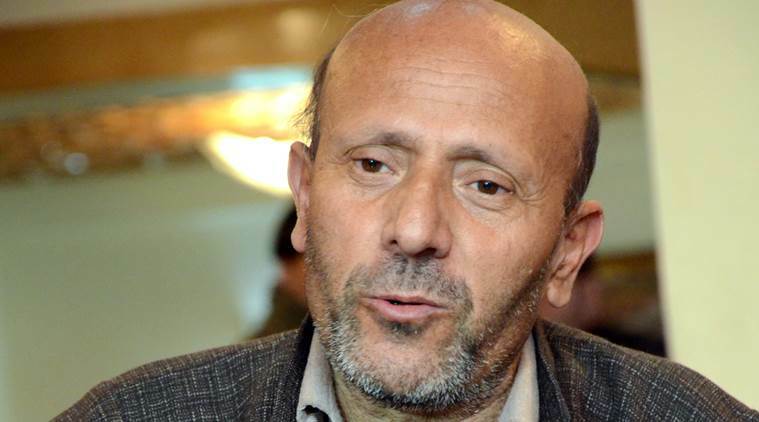 “Our fight is not about protecting internal autonomy including Article 35-A but respecting Article 370 and 35-A is in New Delhi’s own interests,” Rasheed said. The deputation also raised the issue of missing Lolab youth Manzoor Ahmad Khan, release of all political prisoners, shifting every Kashmiri prisoner lodged in jails outside state to their native districts, gross human rights violations by so called village defense committees (VDC’s) in Jammu region, allowing students to form unions in universities and colleges, sufferings of students studying outside state, return of border migrants to their homes in Karen, Karnah, Uri and other sectors, forcible disappearances, withdrawal of FIR’s in police stations against youth for alleged stone pelting, restoring respect and rights of jail return militants and families of active militants and various measures to improve governance at the gross root level. Spokesman said that Rasheed appealed Rajnath Singh to break the tradition of just making promises and expected that Narender Modi’s speech of August 15. would mean something and central government would move beyond words and promises.